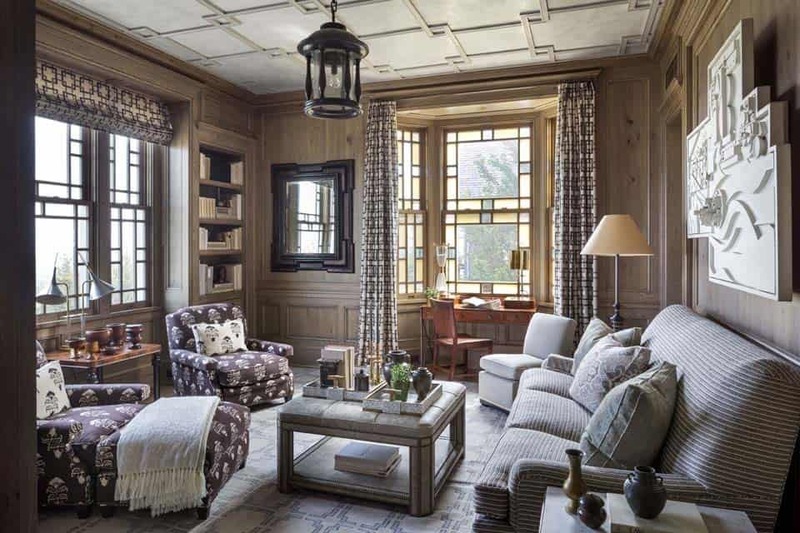 This shingle-style beach house is a striking collaboration between Robert A.M. Stern Architects and designer Steven Gambrel, located in Quoque, New York. 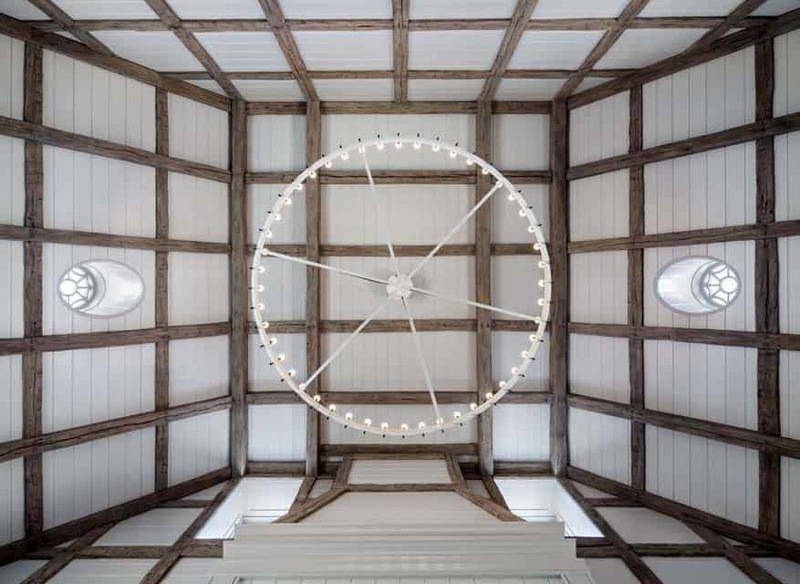 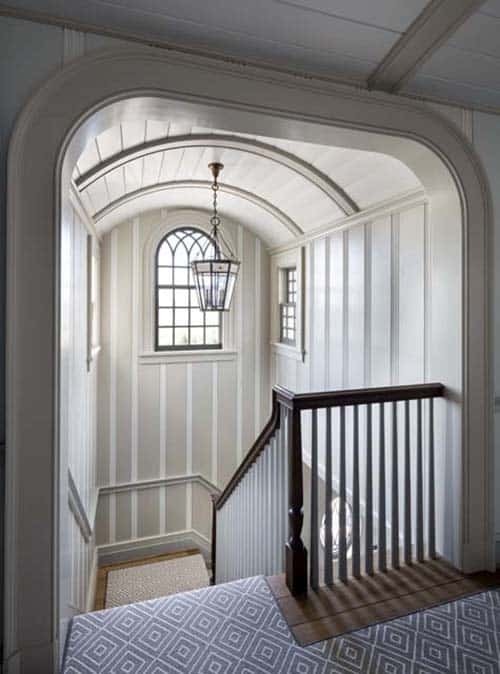 The architecture features the warmth of traditional styling infused with a contemporary elegance. 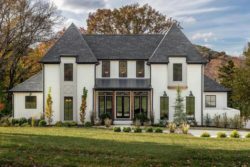 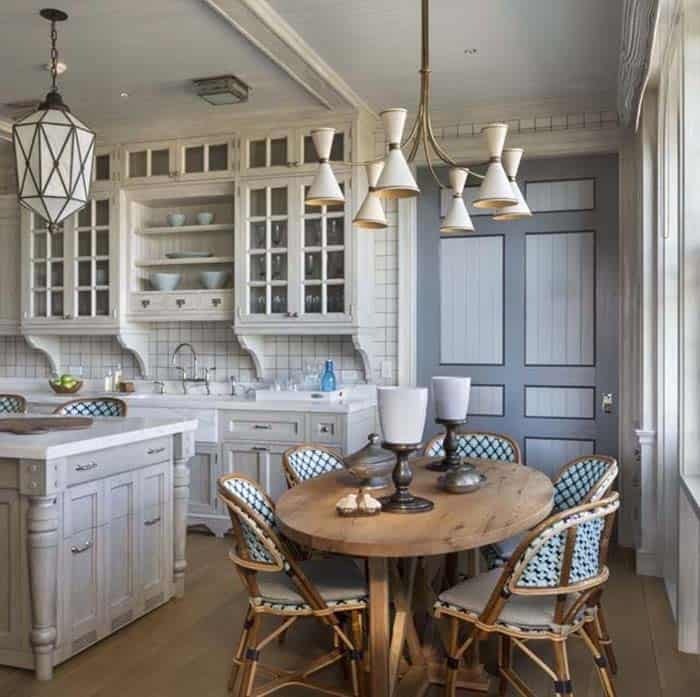 The clients are based in Manhattan, a couple with two college-aged children who were looking to have a house in the Hamptons they could retreat to during the warm summer months for some rest and relaxation. 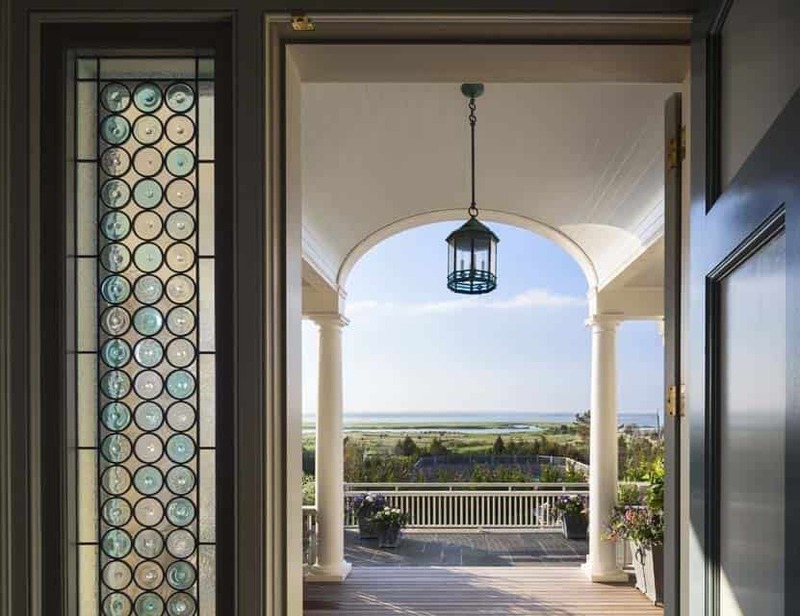 The two-story residence is nestled on just over two acres of sprawling beachfront property, positioned on a dune overlooking Long Island’s South Shore. 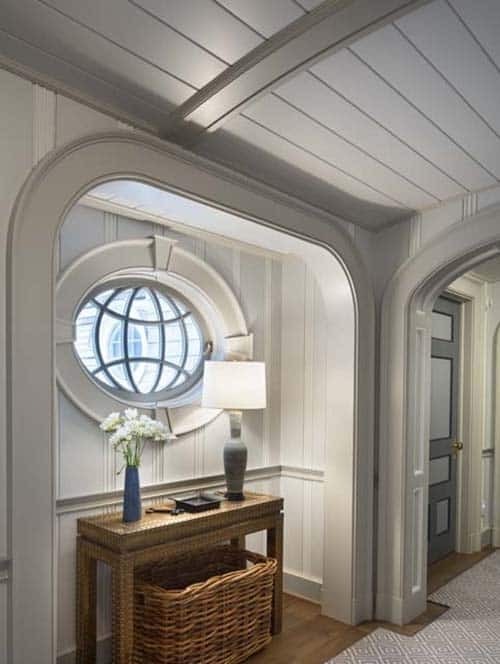 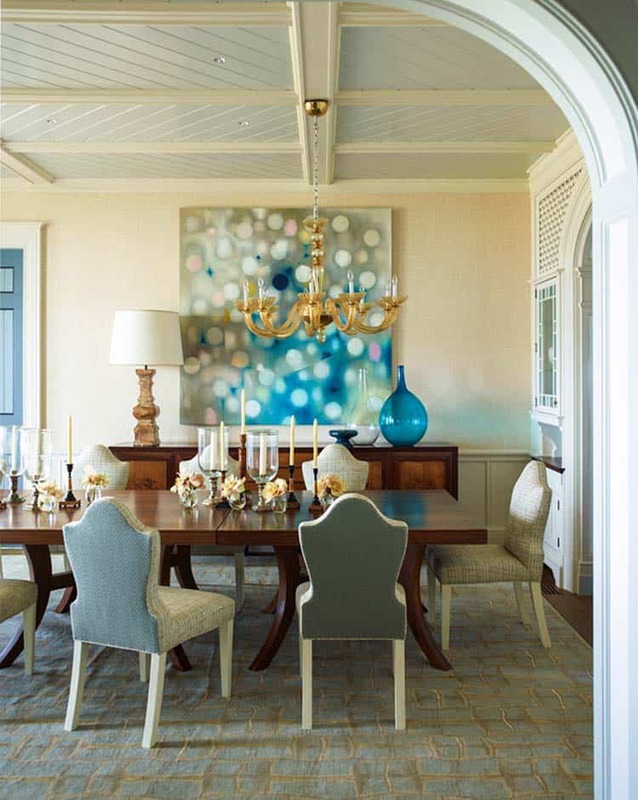 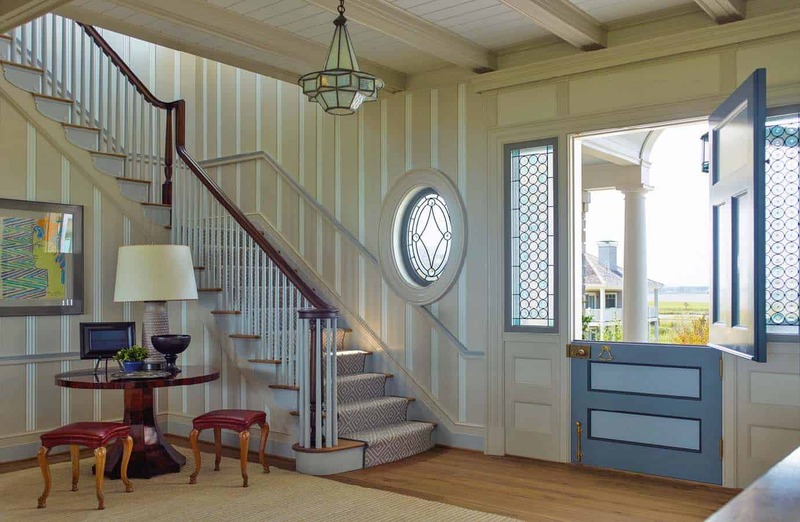 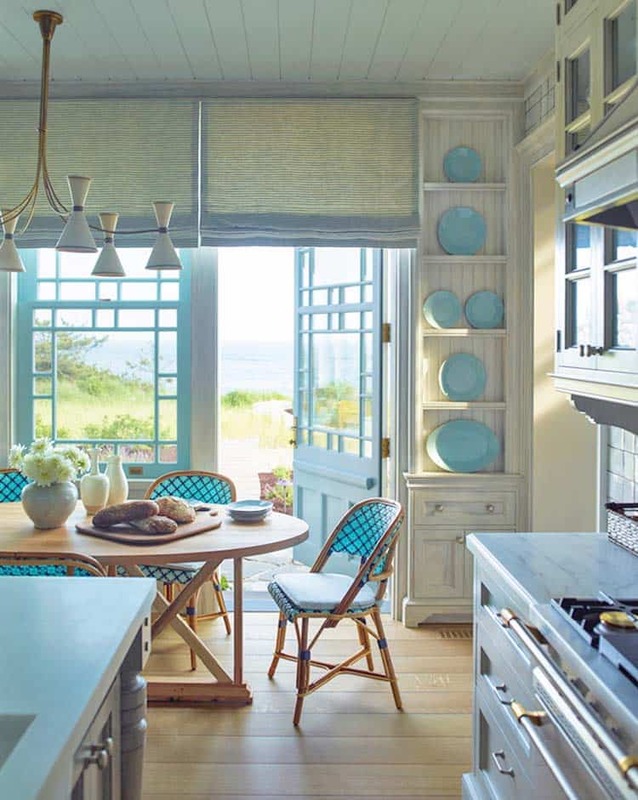 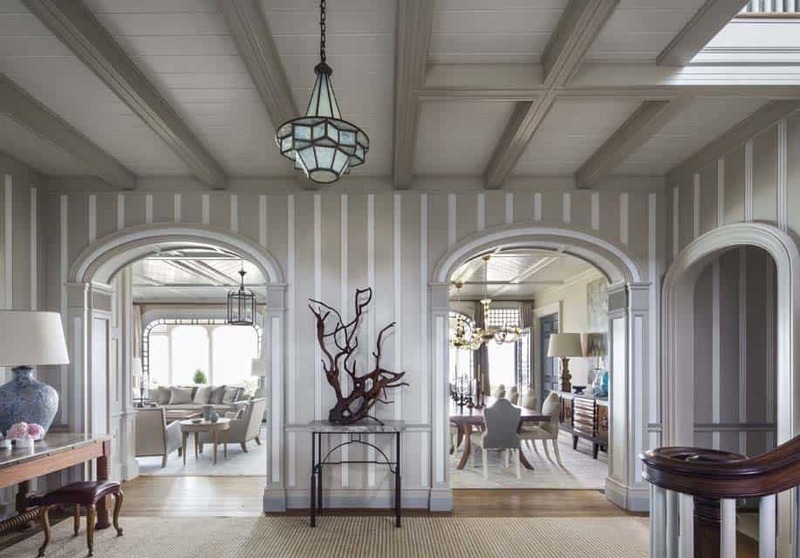 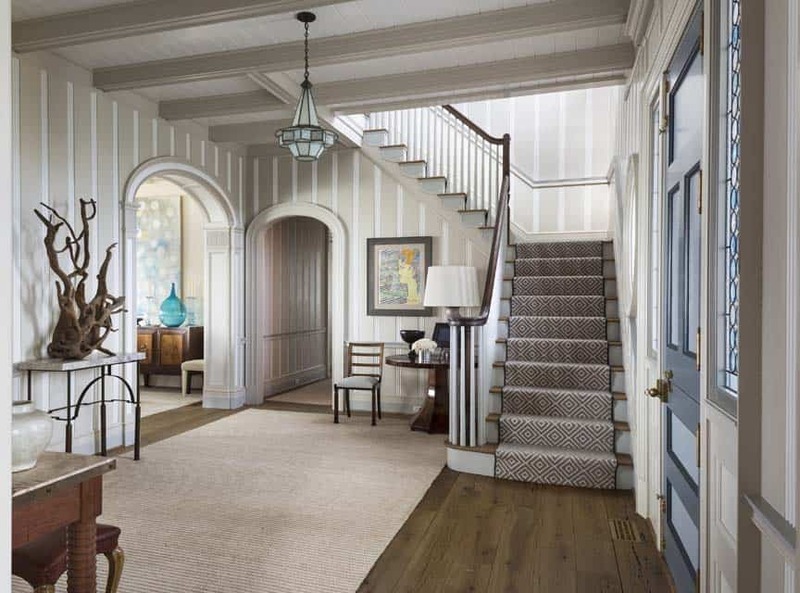 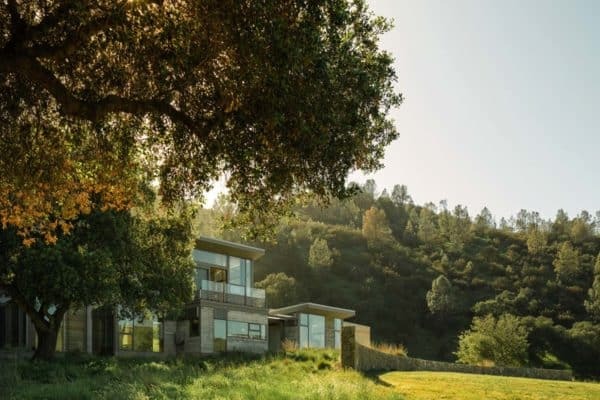 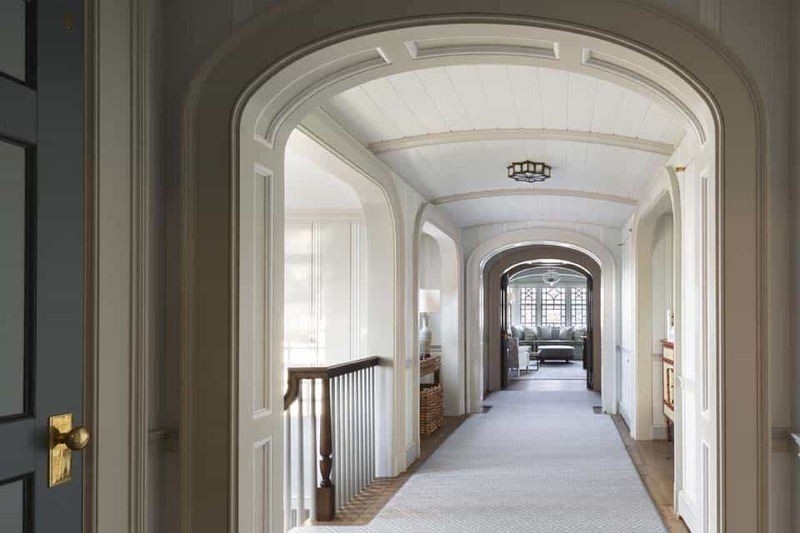 The architects designed eye-catching exterior elements to this 9,500 square foot estate, such as the arched picture window openings and ocean-inspired color scheme, which gets carried through into the interiors of the home. 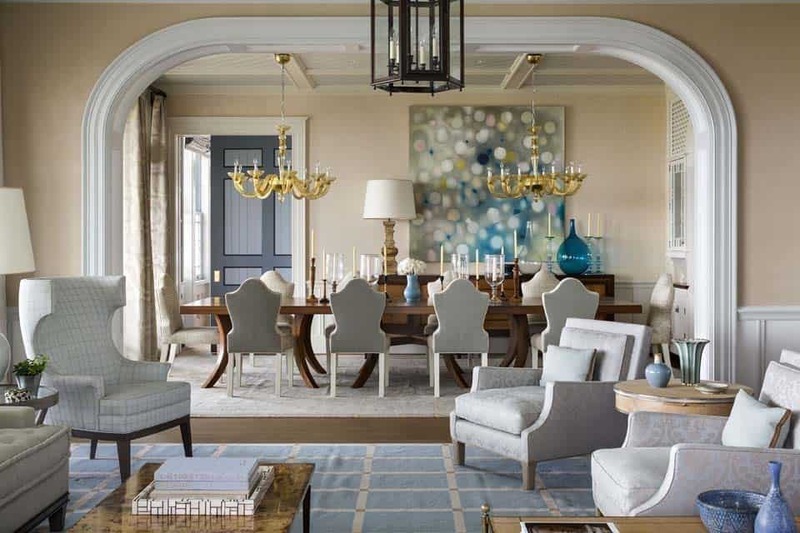 Instead of feeling overdone, the various tones of blue seen throughout the home gives it continuity and visual appeal. 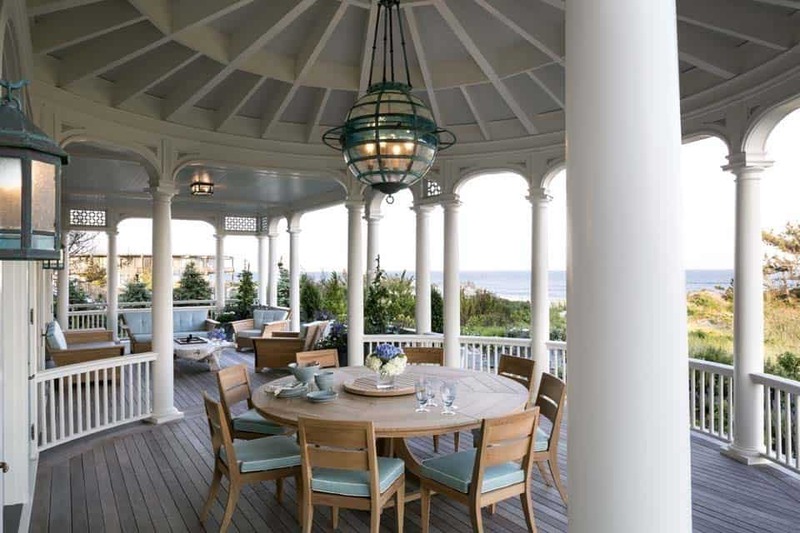 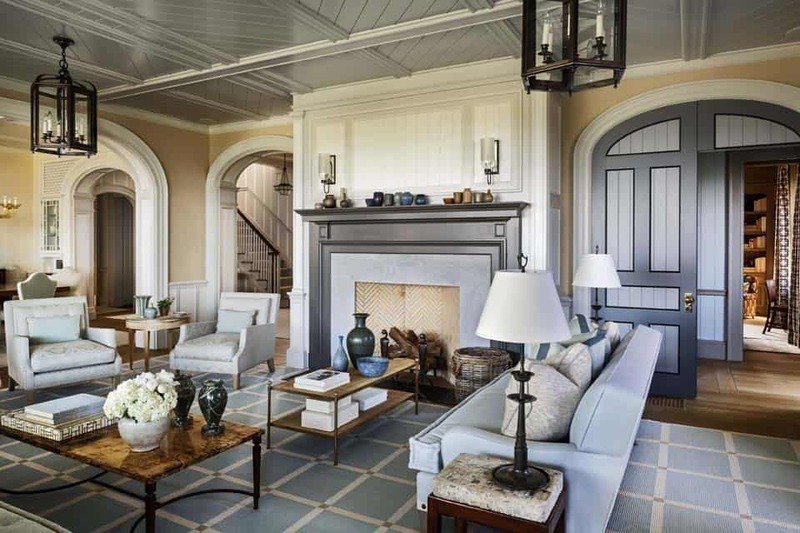 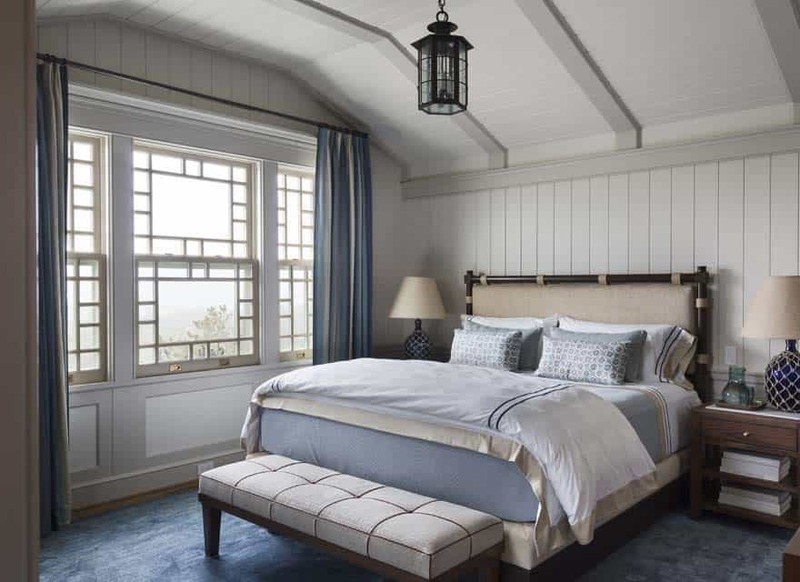 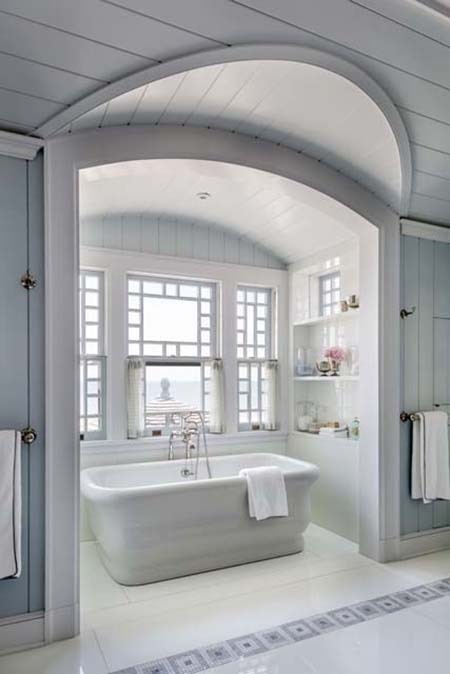 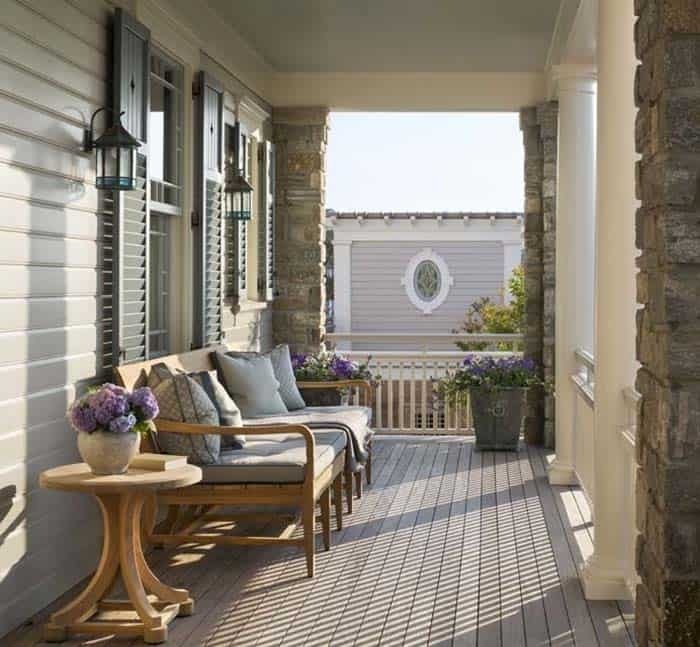 Despite its enormous size, the architects did a fantastic job of keeping this shingle style home feeling low profile with a causal ambiance—making summer living in this shingle-style beach house very appealing! 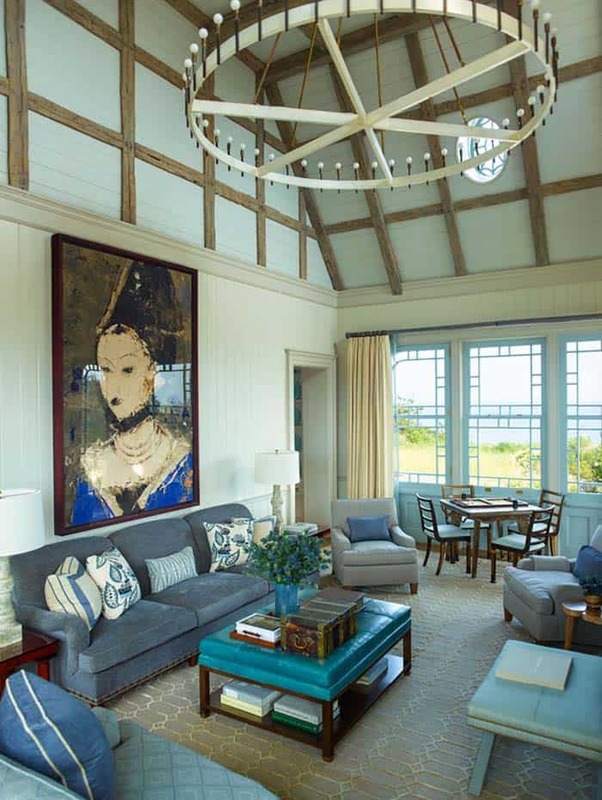 The lowest level of this shingle-style home drops below the dunes, basically a basement that was difficult to design as a welcoming space. 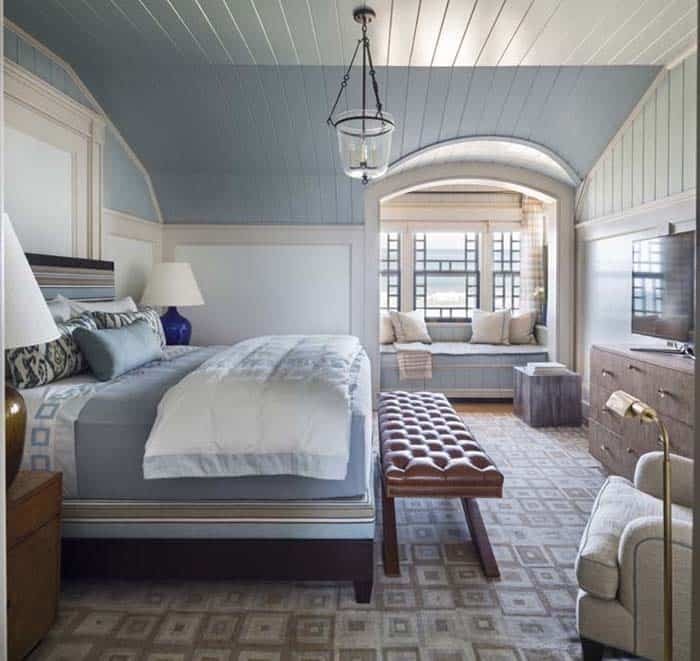 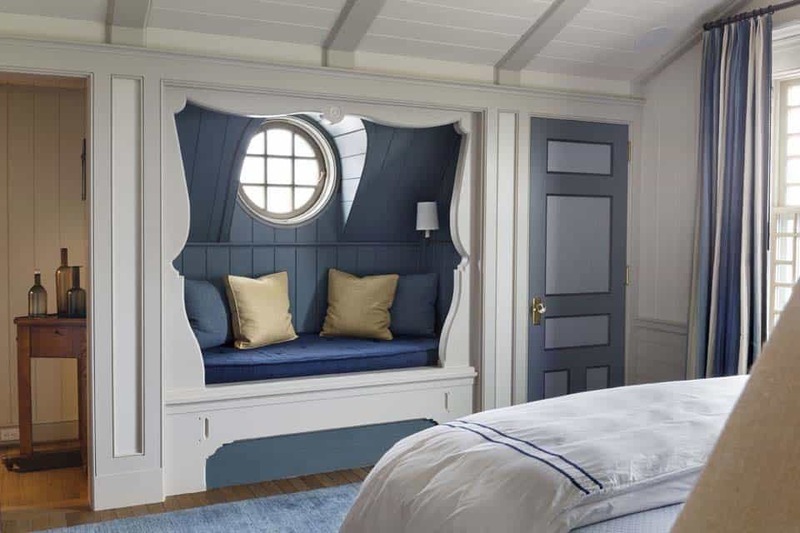 The designers did a fantastic job of utilizing the space, turning it into a media/billiard room with a ping-pong table that frequently makes its way outside, as well as two guest rooms that opens out to colorful gardens. 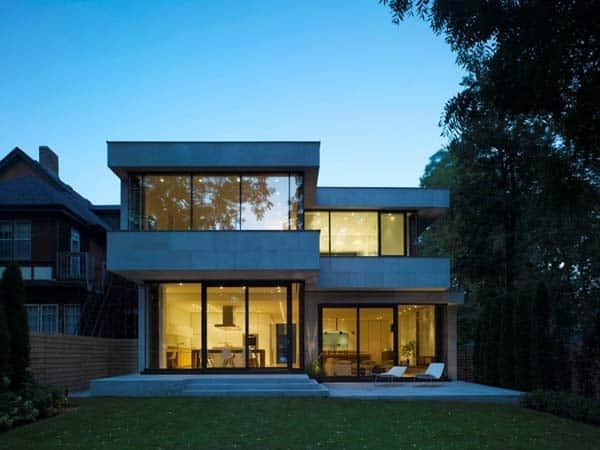 Verdant gardens surrounding the property were designed by Edmund Hollander Landscape Architects. 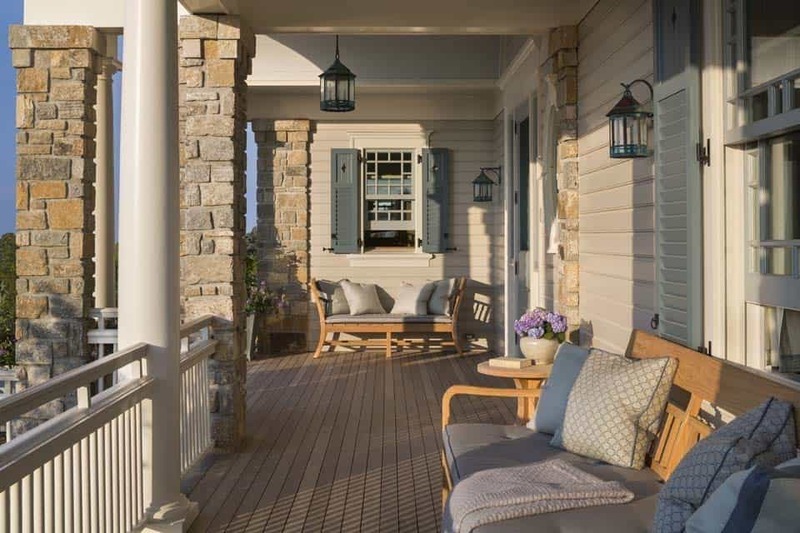 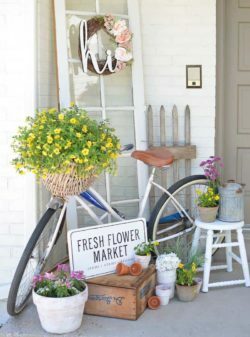 What We Love: This beautiful summer house, although expansive, has been made to feel cottage-cozy, with plenty of charm and wonderful details throughout. 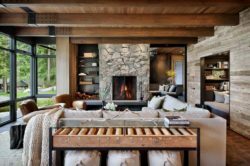 From the traditional styling of the architecture to the well decorated interiors, everything in this home is very livable and inviting. 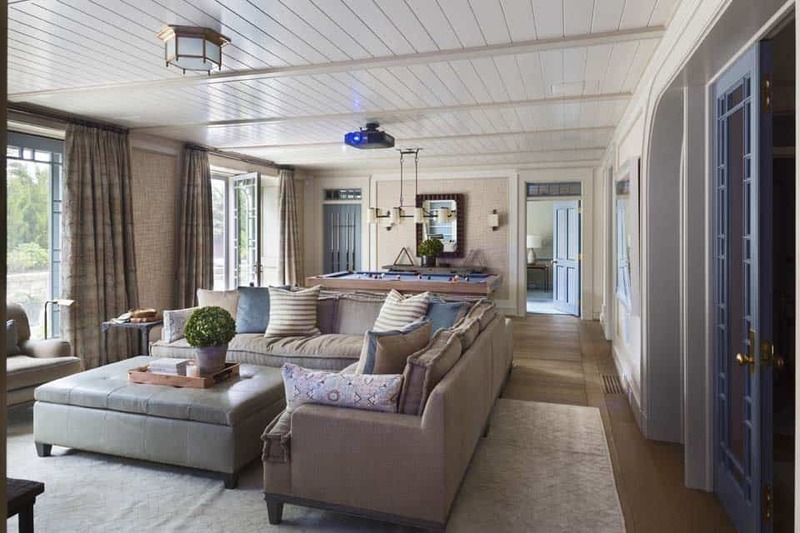 We especially love the expansive swimming pool, it looks like you could entertain a lot of friends and have a fantastic summer vacation! 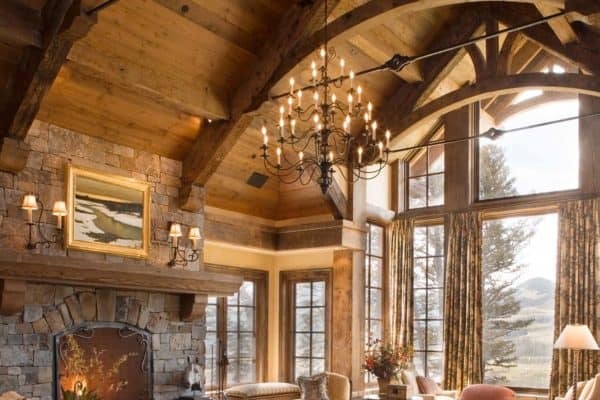 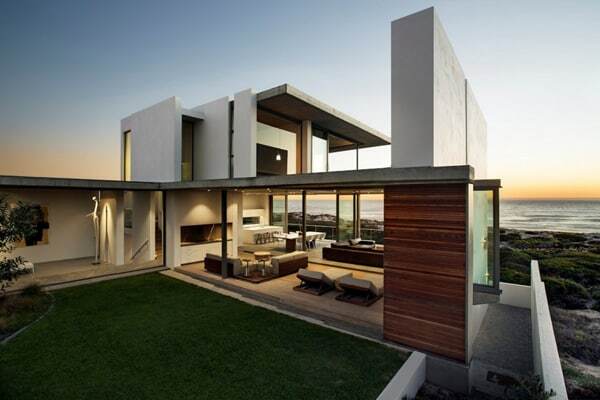 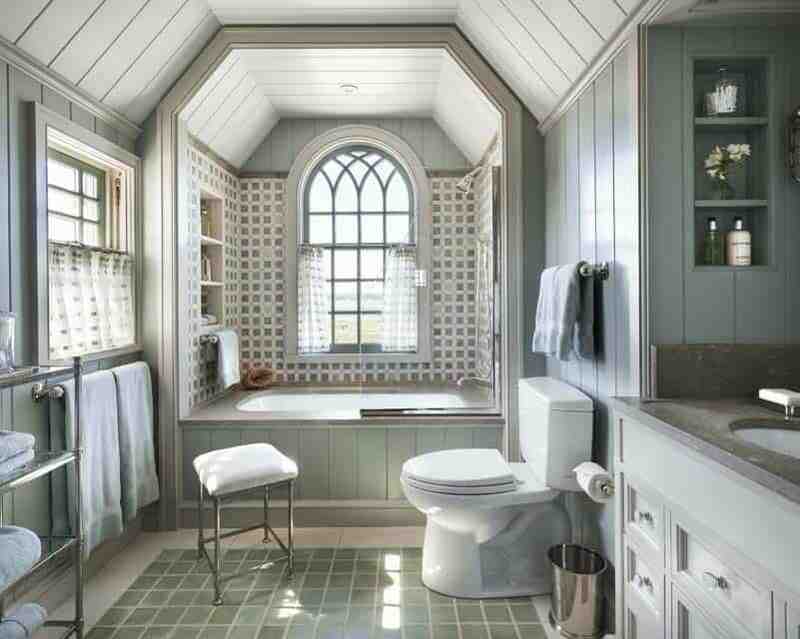 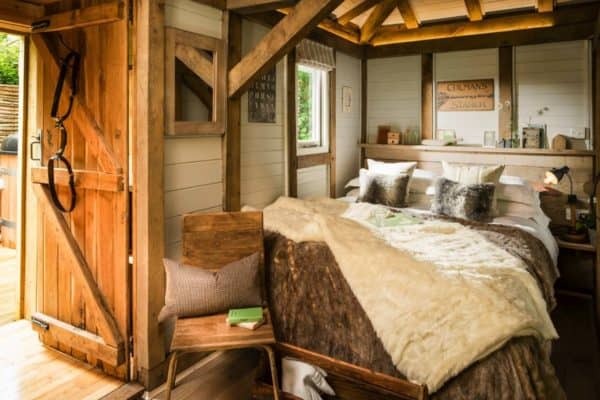 Readers, what are your thoughts, do you think this home is too big for a summer house? 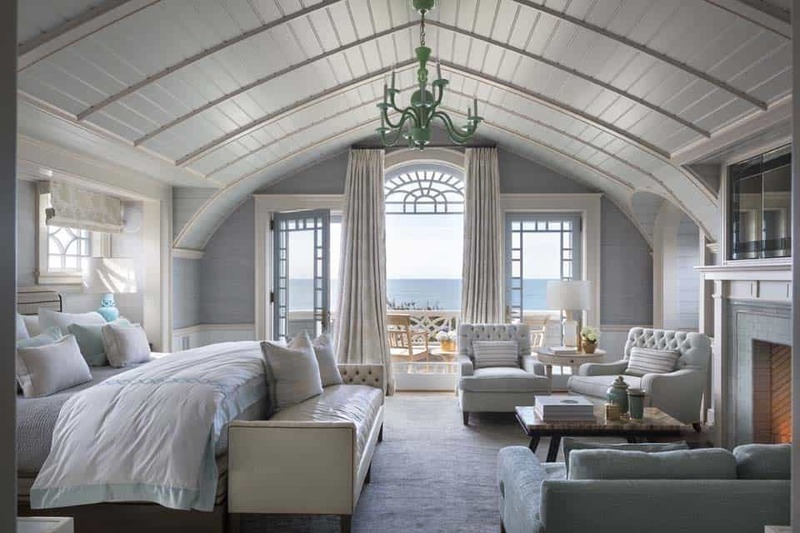 Some time ago we featured another seaside home by the same architects that you don’t want to miss, have a look here, Very charming seaside home in Florida. 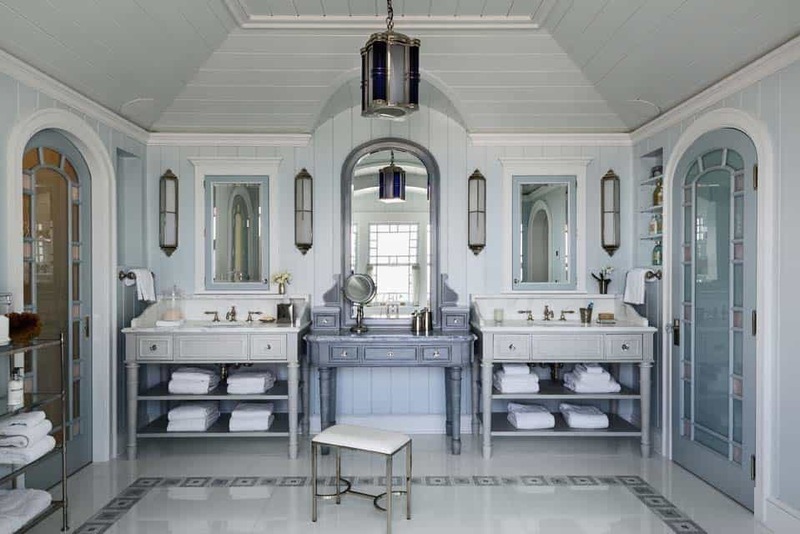 On one side of the property, attached to the house is a sumptuous swimming pool and spa with a large pool house and plenty of sun loungers to entertain family and friends. 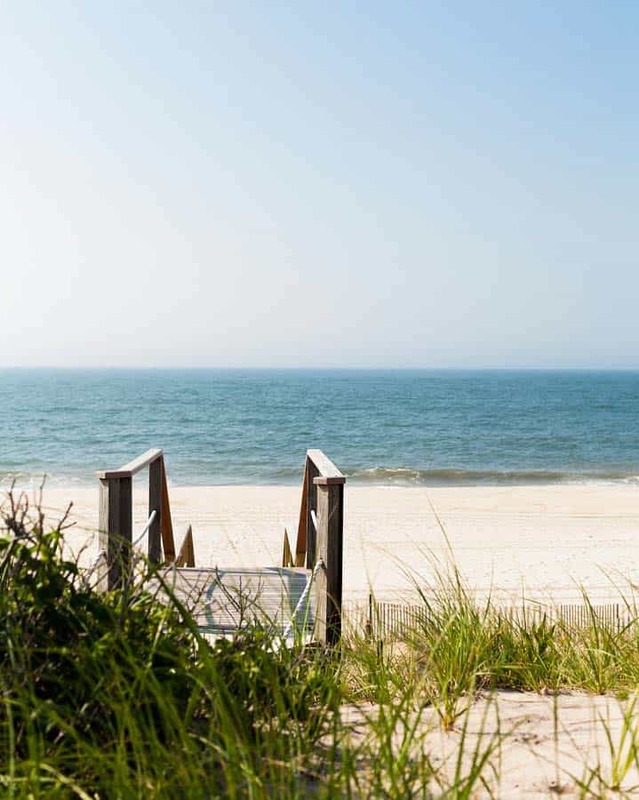 A pathway at the rear of the property leads to the beach, while plenty of windows and balconies feature expansive ocean views.